(INM) For some businesses, having a website is sort of like having a big ol' wooden sign on their building. They put it up to attract customers and then forget about it until it needs serious repair or even replacement. What they fail to grasp is, like most everything in life, wooden signs and websites require ongoing maintenance to keep working properly. It makes no sense to allow it to simply sit out in lonely cyberspace collecting more dust than visitors. This is why INM is offering update packages for all their clients whose webpages are beginning to show their age. The teeming masses that use the Internet are computer savvy enough to recognize an out-of-date website design and may make unwanted inferences about the company as a result. By modernizing your site, you will ensure your best chance for attracting new clients and maximizing the return on your website investment. Similar to most other industries, website design has gone through a number of trends over the years as changes in technology provided more options to developers. Consider, for instance, the look of a website when dial-up modems were still prevalent. A person could get through an unabridged edition of "War and Peace" while waiting for images to load on a webpage. As a result, websites were designed with lot of text because that picture worth 1000 words took far longer to load than the 1000 words. As technology improved, companies began to move away from the text-heavy landscape that had been the norm and started to experiment with more graphics, such as rotating image carousels, videos and other "widgets" to captivate site visitors. Although developers are still mindful of load speed, the more muscular networks now available have added many arrows to the quivers of web designers. Like many of their corporate clients, Industrial NetMedia, is an active member of Leduc's vibrant volunteer sector. From the Black Gold Rodeo Association to the Leduc Minor Softball Association, INM supports many local charities and initiatives. 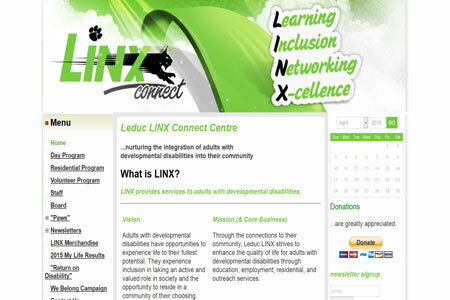 One of our favourite projects, however, is the amazing work done by the LINX Connect group in Leduc. 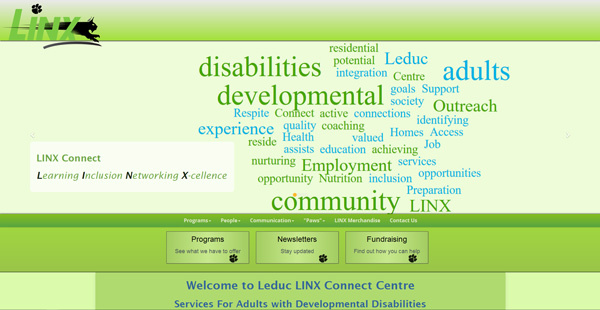 Here are the two Home Pages for the LINX site. Note how much more modern, attractive and impactful the upgraded site is compared to the previous version. If your site looks more like the example on the left than the example on the right, it may be time for an upgrade. Contact Industrial NetMedia today to discover how you can get the most bang for your website buck.